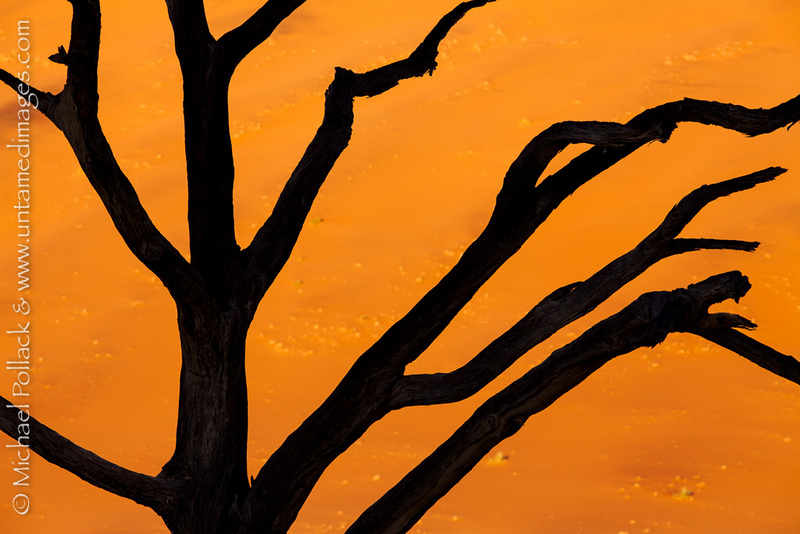 The silhouetted branches of a long-dead tree and a distant sand dune near Dead Vlei combine to create an engaging abstract composition. I created this post’s featured image on my second of two mornings at Dead Vlei, in Namibia’s Namib-Naukluft National Park. Having tried my hand at some iconic Dead Vlei photos the first morning, I felt I had a chance to experiment a bit on the second. The contrast between the Vlei’s shaded dead trees and the sunlit dune west of the Vlei was extreme. Therefore, properly exposing for the bright sand would render the trees nearly black — in silhouette, that is. I just needed to find the right tree and to position the camera so that the jagged outlines of the branches formed a pleasing abstract composition. This picture is one of my favorite attempts at doing just that. Though these trees at Dead Vlei are belived to have died at least 500 years ago, they remain upright today, resisting decay in the hyper-dry climate of Namibia's Namib-Naukluft National Park. 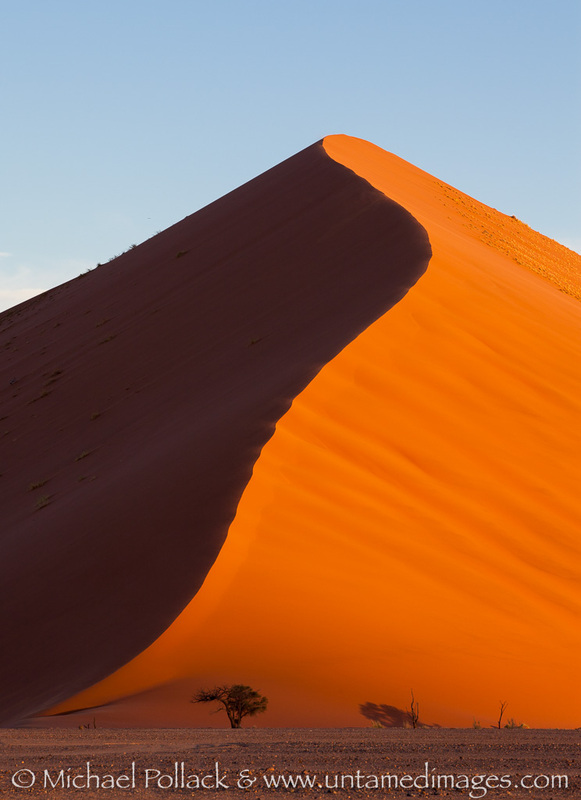 Namib-Naukluft National Park is the largest conservation area in Africa, and for many visitors its main attraction is an area commonly known as “Sossusvlei” famous for its plethora of towering, reddish sand dunes. 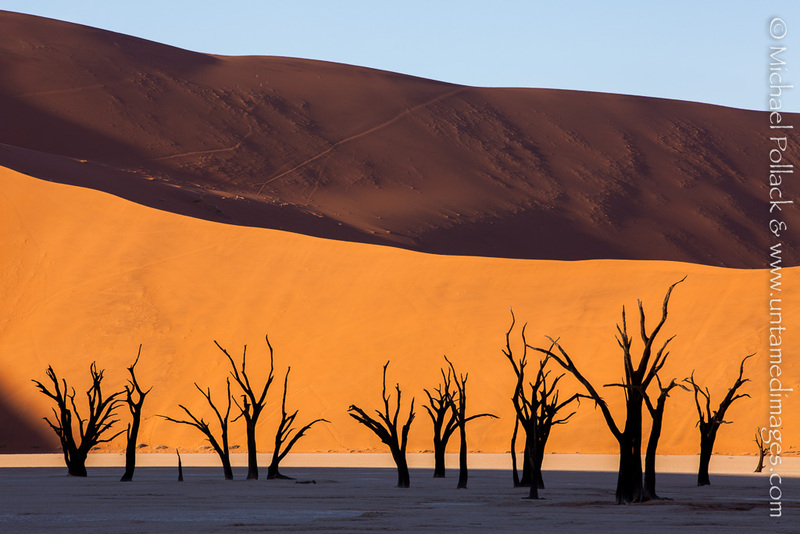 Within Sossusvlei is a magical spot called Dead Vlei, which is nestled between the giant dunes and is characterized by a flat, white, clay pan and a forest of dark tree “skeletons”. According to Wikipedia, Deadvlei means “dead marsh” (from English dead, and Afrikaans vlei, a lake or marsh in a valley between the dunes). Standing in the middle of a bone-dry desert, the last thing Dead Vlei reminded me of was a marsh! Yet centuries ago flood waters from the Tsauchab river left behind sediments that created the pan, and provided sufficient water for many camel thorn trees to grow. Since then, changes to the climate, perhaps in conjunction with the build up of the sand dunes, severely curtailed the amount of water reaching the vlei and caused the trees to die. While the die-off is estimated to have occurred 500-600 years ago, the rate of decay in this arid desert is so slow that the trees remain standing to this day. Dead Vlei’s combination of white clay, red sand, blue sky, and dark ghostly trees has created a photographers’ paradise. With the angle of the sunlight changing throughout the day (and to a lesser degree throughout the year), and wide range of possible compositions, the photographic possibilities at Dead Vlei are nearly limitless. So, while I cherished my two mornings at Dead Vlei, I hope to have the opportunity to return someday and pick up where I left off. The image in this post is one that I feel conveys the essence — and the beauty — of the place. One of Namib-Naukluft National Park's massive sand dunes rises above the valley floor bathed in warm late-afternoon sunlight. It was our first afternoon among the giant dunes of Namib-Naukluft National Park in Namibia, and Alison and I were focused on finding the best spot to capture the beauty of the place. With their ochre hues and sinuous profiles, all of the dunes along the 35 miles stretch of road we had before us were begging to be photographed, and we were fighting the irrational desire to clone ourselves and be at many locations at once. And because the photograph I was seeking would be obtained in the last 30 minutes before the sun set, when shadows are long and the light shines in warm tones, we were under time pressure. The dunes in the National Park are among the tallest in the world and certain ones in particular are famous for their size and beauty. One of the landmark dunes is called Dune 45, due to the fact that it lies relatively close to the road near the 45 kilometer mileage marker. We had been told that it was the best place to go for sunset and so we went to see for ourselves. While Dune 45 is indeed beautiful, it has a parking area right at its base, and on the afternoon we were there, several tourists were climbing up the dunes spine towards its peak. I wanted to avoid any signs of man in my photograph, so we left Dune 45 in search of a more pristine subject. A few miles back up the road we had noticed a stunning dune that I thought had great promise, but the sun was now quite low in the sky and there was little time left to reposition. Alison drove hastily back to our “plan B” dune, which just happened to be located at the 40 kilometer marker, and I immediately jumped out of our truck with camera and tripod in hand. I had just enough time to set up my equipment, compose the photograph, and depress the shutter before “Dune 40”, as we decided to call it, began to descend into shadow. In fact, you can see a slight darkening at the foot of the dune in the above photograph, but I think that lends a bit of intrigue to the image, and it is a happy reminder of our victory in a race against the sun.